Inn at Valley Farms of Walpole, New Hampshire. 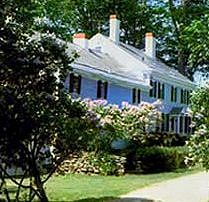 The Inn at Valley Farms is located in Walpole, New Hampshire, said to be one of the most picturesque towns in all of New England. This charming, village offers fine dining, some of the world's best chocalate, art gallery, museum, challenging 9-hole golf course, and Sunday concerts on the common. Conveniently located to numerous attractions, the Inn at Valley Farms is a special place to plan your next family or romantic getaway. 105-acre organic farm with walking trails and spellbinding views. Multi-course gourmet breakfast made with our own fresh eggs and organic produce. Self-sufficient cottages complete with full kitchen, satellite tv, and room to sleep six - perfect for family vacations, small group getaways or extended stays. This and other New Hampshire Bed and Breakfast Inns can be found here online in The Register.